Nanopatterned 2D and 3D photonic crystal Fluorine-doped Tin Oxide (FTO) electrodes were created with nanoimprinting lithography. 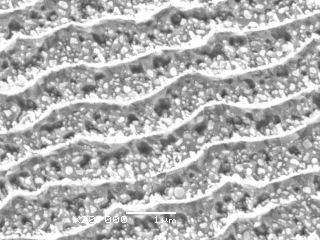 Au particles (~50-200 nm in diameter) formed on the nanopatterned FTO electrodes through evaporation followed by annealing. 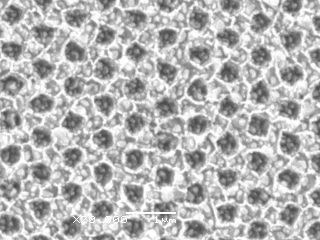 The morphology and particles size were characterized by SEM. The plasmonic effects were investigated via UV-Vis spectra transmission mode. Localized surface plasmon resonance position depends on the Au particles structure and size irrespective to FTO pattern while transmittance relies on the pattern of FTO, Au particles structure and size. Simulation predicts an enhanced scattering on such a structure.